A friend recommended this. I’ve only read the Kindle sample, but already I’m convinced. A radical call to reform, Church Zero is a punk-rock approach to the pressing issue of gaining ground as rapidly as the early church. With a fresh perspective forged in the dirty trenches of international post-Christian societies, Peyton Jones pulls no punches as he brings this message to the American Church: We have lost our way. The church is losing ground fast: losing the generation under age 30 and drawing few nonbelievers toward Christ. Christ gave us a leadership model for commando outreach, and the church has ignored it for too long. Will we continue down the path of self-preservation, defending our stalled church structures? Or will we follow the blueprint Jesus lays out? 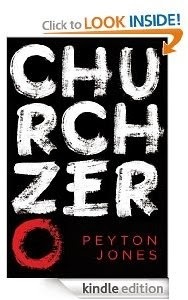 Church Zero challenges readers to once again become a radical, dangerous people who cannot be ignored. It’s time to break out! “For years I have been frustrated, because I have been the smelly kid in class, and no other kids want to play with me. But I didn't realize I was the smelly kid until I read this book. Before God formed me in the womb, He had ordained me for a specific role in the church that He clearly laid out in the New Testament. There is no place in today's church for the role God made me for (and for several others), because the traditionalism of the church has blinded it to roles God clearly used to plant churches in Acts. These absence of these roles in today's ministry model blinded me to how God wanted to use me. Trying fill the New Testament role that God designed me for in today's church ministry model is like being a round peg who is trying to fit into a square hole. Through Peyton Jones, the Holy Spirit lays out the forgotten ministry model He used to plant churches for the first 300 years of church life. It's a model that we need to seriously look at, if we want to plant churches in the leading and power of the Holy Spirit. Today there are countless church growth models and programs and plans out there. Most of them are dependent on the schemes and strategies of men. While many of them will lead to a much larger congregation, they will typically lead to fewer disciples. There are however, in the Bible itself, a few models and practices which are Spirit led and will lead to church growth that is dependant on the work of the Holy Spirit and based on Jesus command to make disciples. Max and the Gatekeeper By James Todd Cochrane. ESV Audio Bible in either MP3 or M4B format. Four Books for the Backyard Gardener!